The University of Connecticut has a great website (http://www.hort.uconn.edu/ipm/) loaded with information about Integrated Pest Managment (IPM). Go to the Pest management for growers, then click the 'Vegetable Pest Message'. This information is updated weekly on Friday so check often to see what pest are currently a threat to you plants. Team-Pumpkin is all about new growers and the basics of giant pumpkin growing. We fully expect that once you have mastered the essentials you will want more advanced information. This is when BigPumpkins.com will become a valuable resource. It can be a little overwhelming for the new grower but it does have much more information. 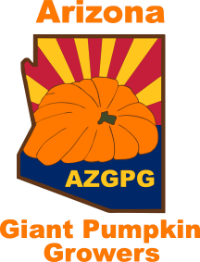 The Arizona Giant Pumpkin Growers have come together with a quest to overcome the Sonoran Desert and beat the Arizona State Record for giant pumpkins. Team-Pumpkin is proud to see them embrace many of the same ideals that make us who we are. We have dubbed them Team-Pumpkin Southwest Branch ! (yes we are everywhere). Please visit the site and follow their "Operation 501". The big weigh-off event is scheduled for May 28, 2016.